International Shipbreaking Ltd., part of the EMR Group, has won a Navy contract to tow the former USS Independence from Bremerton, Wash., to Brownsville for dismantling. 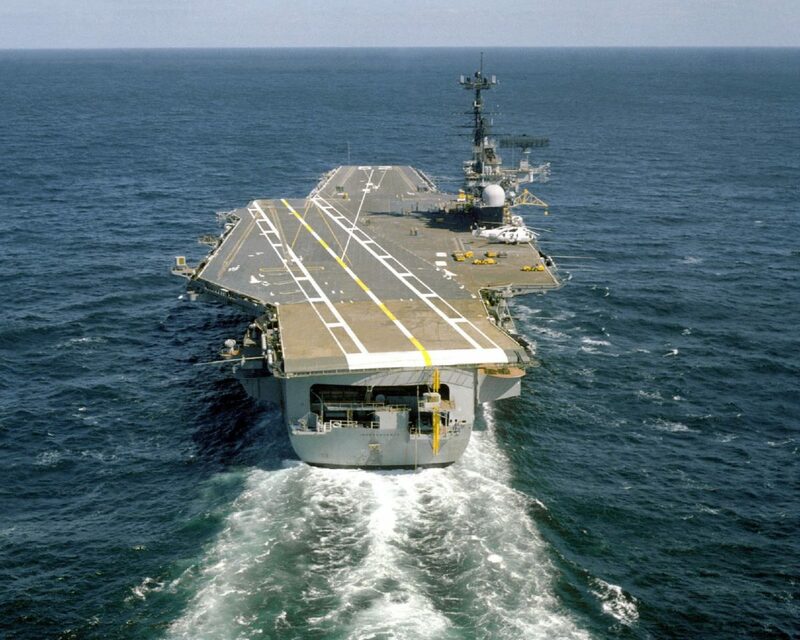 The aircraft carrier, commissioned in 1959 and decommissioned in 1998, is shown from the stern in this 1979 photograph. The arrival of the USS Independence is being delayed a couple of days because of mechanical issues. The decommissioned aircraft carrier is now expected to arrive at the Jetties on Thursday, June 1 around 9 a.m.
BROWNSVILLE — The arrival of the USS Independence is being delayed a couple of days because of mechanical issues. The decommissioned aircraft carrier is now expected to arrive at the Jetties off South Padre Island on Thursday, June 1, at around 9 a.m.
International Shipbreaking Ltd., the company contracted to scrap the ship at the Port of Brownsville, says the massive tug towing the Independence, the Dino Chouest, has experienced a failure of the portside main engine. The offshore tug/supply ship was originally scheduled to arrive in the Valley on Tuesday morning. International Shipbreaking Vice President Robert Berry said the company is planning a ceremony at Isla Blanca Park for veterans who served on the Independence, which was commissioned in 1959 and decommissioned in 1998. The USS Indy, as it is known, is the last of the Forrestal-class carriers, which runs on conventional-powered supercarrier. The ceremony will begin at around 8 a.m. at Dolphin Cove and include a color guard, a number of guest speakers and a moment of silence as the carrier passes. The Dino Chouest began the 16,000 mile voyage of towing the USS Independence in early March in Bremerton, Wash. In mid-April, it passed through the Strait of Magellan and then traveled north.